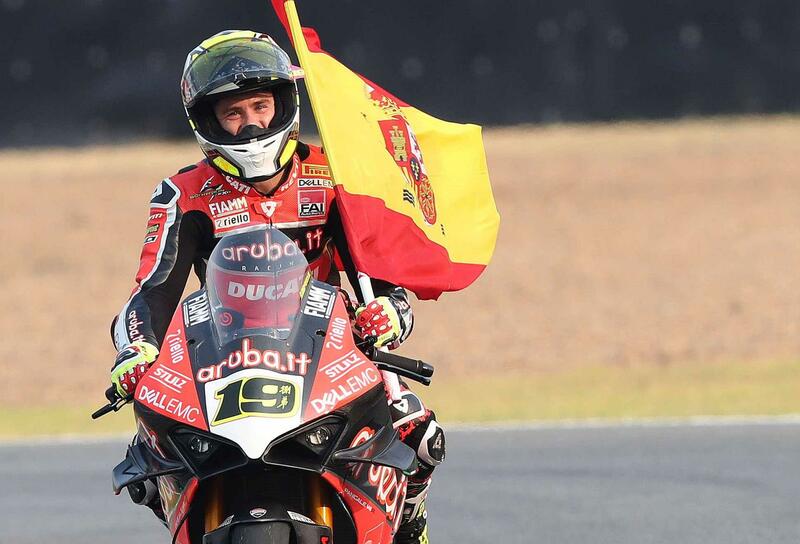 In a second day of racing action, the Spanish rider crossed the line 2.042 seconds ahead of Rea in the first Tissot Superpole sprint race, before marching on to a commanding third win in race three, 10.053 seconds ahead of the rest of the opposition. Such dominance so early on in a season is something unseen for a long time, with even four-time world champion, Jonathan Rea, losing the occasional race to the likes of Tom Sykes, Chaz Davies and Leon Haslam in the early stages of each of his championship wins. The last person to win the opening six races of a World Superbike season was Neil Hodgson, back in 2003 – also on a Ducati. This morning’s sprint action saw a closely-contended battle between Bautista and Rea, with Rea grabbing the advantage into turn one. A carbon-copy of Saturday’s action, the two riders then began dicing for the lead. After gaining the advantage early on, a mistake from Bautista at turn three allowed Rea back past underneath him, however the Ducati man was then able to reclaim the lead at turn four, before creating a gap. This left Rea to contend with the Pata Yamaha of Lowes, who began pressuring for second position. Elsewhere, having already retired from race one, Moriwaki Althea Honda rider Ryuichi Kiyonari again pulled out of the sprint. 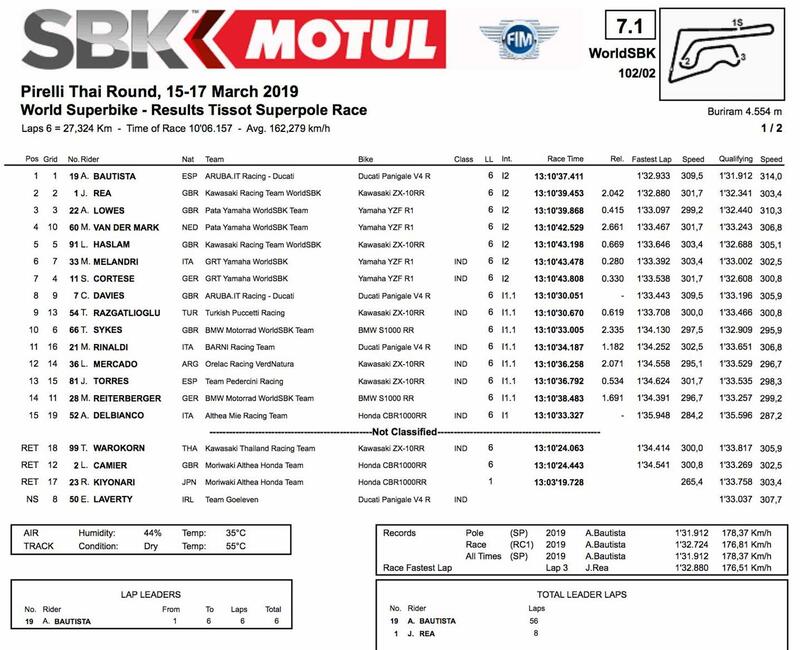 His teammate, Leon Camier, had no better luck either, after an incident with local wild card Thitipong Warokorn at turn three ended the race prematurely with a red flag and meant he would be unable to start the final race of the weekend. The final race results showed an exact replica of the first race of the weekend, with Bautista leading Rea and Lowes for the podium. Behind them came Michael van der Mark, Leon Haslam and Marco Melandri. The final race of the weekend saw much of the same again, however this time Bautista managed to secure first position heading into turn one. From there, the Ducati Panigale V4R rider began pulling out a gap, eventually crossing the line 10.053 seconds out in front. He was again followed over the line by the Kawasaki ZX-10RR of Jonathan Rea, who lead the Yamaha R1 of Alex Lowes by a further 2.315 seconds. The trio of front runners began gapping the rest of the field early on and slotted into a rhythm that stayed the same until the end of the race, despite Rea and Lowes swapping faster lap times in a battle that saw them within a second of one another for a large proportion of the race. Behind them, once more it was the trio of Melandri, Haslam and van der Mark all fighting for fourth place in some of the closest-contended racing of the weekend. A battle eventually won by the Pata Yamaha of van der Mark, three-way scrap was played out across all three races of the weekend, with the Dutch rider claiming fourth spot on every occasion. 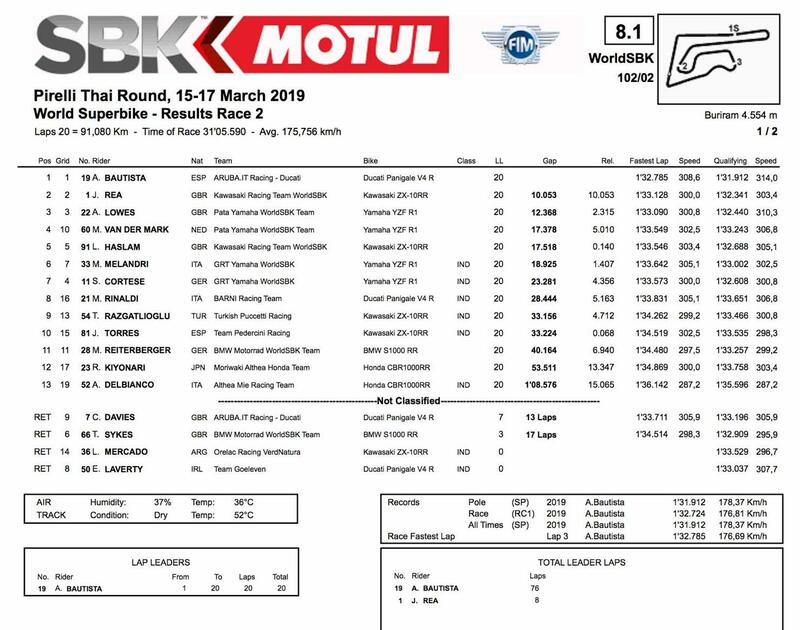 Away from them, it was a disastrous weekend for Bautista’s teammate Chaz Davies, who leaves the Thai round with just three more championship points, after crashing out of race one and retiring in the third. This bad luck was shared by fellow Panigale V4R rider, Eugene Laverty, after his Goeleven team were unable to rebuild his bike after his final turn off during race one. Other non-finishers included the BMW of Tom Sykes, who pulled off the circuit with 17 laps still to run. His teammate Markus Reiterberger finished the race in 11th place.